Change Your Food... Change Your Life! Let me paint a picture for you: It's first thing in the morning, the kids aren't out of bed yet (you barely woke up for that matter), the dog is whimpering to go out and your significant other is already on their way out the door for work... at least the coffee pot started automatically... too bad breakfast can't start itself as well. Does this sound familiar? There are so many great ways to use granola in baking! My Homestyle Granola especially because it's already soft so it blends into recipes very nicely. We are always experimenting in the bakery and my team decided to have some fun with our Vanilla Almond Homestyle Granola and this is what they came up with, give it a try and let us know what you think! It's that time of year again, when all of the kiddos are going back to school... keep their tummies full and brains energized with healthy snacks that nourish their bodies! Below are some great ideas that I've spotted online as well as my wholesome baked goods that we know kids will go for. I love all of these ideas because you can so easily adjust the ingredients to fit what your kids will enjoy. Snacking is my secret to not over eating during the day! Healthy snacking can be challenging if you're not prepared, that's why I take at least one day out of the week to get everything chopped, sliced, seasoned, and/or baked. One of my favorite snacks is almonds... I love the crunch, flavor and healthy nutrients they add to my diet! Not too sweet and gluten free! 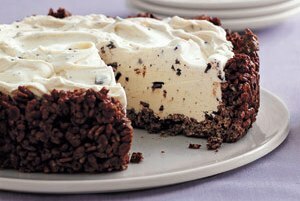 Ice Cream Pie with a Chocolate Granola No Bake Crust! As you all know, I'm an avid supporter of healthy eating... but we all need a treat now and then! My rule for when I indulge is to make sure there are still some wholesome ingredients that my body can gain nutrients from. A very simple recipe that I like to make for friends and family is ice cream pie... who doesn't love ice cream (or frozen yogurt)?